Every year around the holidays we get busy doing fundraising mailings for some of our clients. Usually what that entails are preparing individual letters, sometimes sorted by expected donation size, match them with printed envelopes, usually we stamp them, we also sometimes include some other promotional item together with a pre-printed remittance envelope where the donor can check off a suggested donation and enclose a check in the pre-addressed envelope. By the way, following the success of Howard Dean, many non-profits are making it easier to donate on their web sites. Don’t forget to include that in your list of things to do. It’s convenient and easy. But the mails still work well in getting in the funds, and getting people to your website as well! Here's a mailing we just got out for the Kingsbrook Jewish Medical Center. 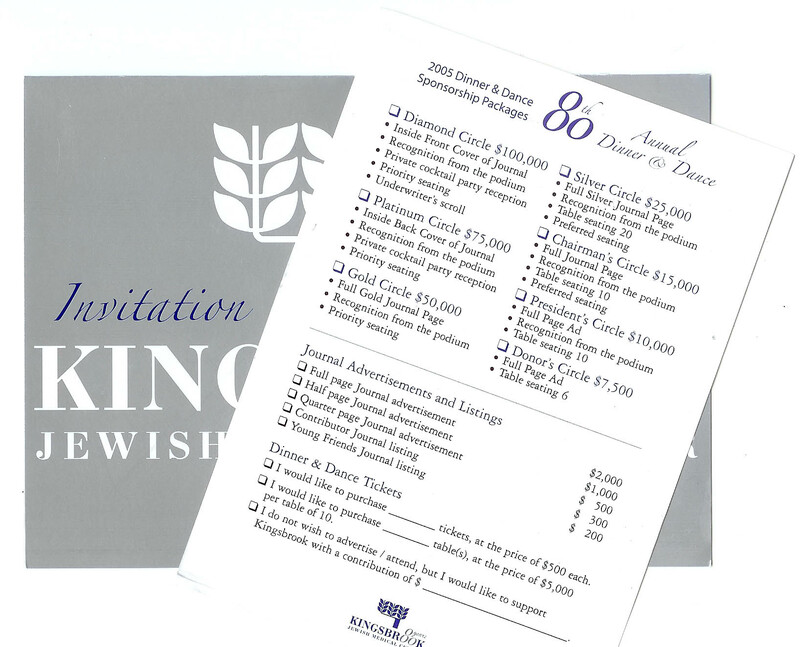 It's for a dinner dance and includes a solicitation for journal advertising. The mailing also included a self addressed return envelope and a special insert honoring the sponsor.